Commission Regulation (EC) No 1794/2006 (3) lays down the necessary measures for the development of a charging scheme for air navigation services that is consistent with the Eurocontrol Route Charges System. The development of a common charging scheme for air navigation services provided during all phases of flight is of the utmost importance for the implementation of the single European sky. The scheme should achieve greater transparency with respect to the determination, imposition and enforcement of charges to airspace users and cost efficiency in providing air navigation service. It should also encourage efficiency of flights while maintaining an optimum safety level and stimulate integrated service provision. In order to ensure that the overall objective of improving the cost efficiency of air navigation services is effective, the charging scheme should promote the enhancement of cost and operational efficiencies in consistency with and in support of the European Air Traffic Management Master Plan. Regulation (EC) No 1794/2006 needs to be updated in order to translate the financial consequences of the performance scheme into the charging scheme, particularly with regard to the cost and traffic risk sharing mechanisms as well as the incentive schemes described in Commission Regulation (EU) No 691/2010 of 29 July 2010 laying down a performance scheme for air navigation services and network functions and amending Regulation (EC) No 2096/2005 laying down common requirements for the provision of air navigation services (4). Regulation (EC) No 1794/2006 should therefore be amended accordingly. Appropriate provisions should be provided to ensure a smooth transition to the updated charging scheme. ‘1. This Regulation lays down the necessary measures for the development of a common charging scheme for air navigation services that is consistent with the Eurocontrol Route Charges System.’. ‘5. Subject to Article 1(3) third sentence of Commission Regulation (EU) No 691/2010 (5), Member States may decide not to apply this Regulation to air navigation services provided at airports with less than 50 000 commercial air transport movements per year, regardless of the maximum take-off mass and the number of passenger seats. Member States shall inform the Commission of that decision. The Commission shall periodically publish an updated list of those airports where Member States have decided not to apply this Regulation to air navigation services. set terminal unit rates as referred to in Article 13 of this Regulation. The first subparagraph shall apply without prejudice to the application of the principles referred to in Articles 14 and 15 of Regulation (EC) No 550/2004 and is subject to Article 1(3) third sentence of Regulation (EU) No 691/2010. The Member States which decide not to apply the provisions listed in the first subparagraph shall carry out a detailed assessment of the extent to which the conditions laid down in Annex I to this Regulation are met. That assessment shall include consultation with the representative of airspace users. Those Member States shall submit a detailed report to the Commission on the assessment referred to in the third subparagraph. That report shall be supported by evidence, include the outcome of the consultation with users and shall provide full reasons for the Member State’s conclusions. After consultation with the Member State concerned, the Commission may determine that the conditions laid down in Annex I to this Regulation have not been met and may, at the latest two months after reception of the report, request that the Member State re-conduct the assessment under revised conditions. Where the Commission makes such a determination, it shall identify which part(s) of the assessment is/are to be revised and shall state the reasons therefor. Where the Commission has requested a revised assessment, the Member State concerned shall submit a report on the conclusions of that revised assessment within two months after reception of the Commission’s request. The final report shall be made public and shall be valid for the duration of the reference period concerned. “other revenues” means revenues obtained from public authorities or revenues obtained from commercial activities and/or, in the case of terminal unit rates, revenues obtained from contracts or agreements between air navigation service providers and airport operators, that benefit air navigation service providers with regard to the level of unit rates.’. ‘1. The charging scheme shall be subject to the principles set out in Article 15 of Regulation (EC) No 550/2004. 2. The determined costs of en route air navigation services shall be financed by en route charges imposed on users of air navigation services in accordance with the provisions of Chapter III and/or other revenues. 3. The determined costs of terminal air navigation services shall be financed by terminal charges imposed on users of air navigation services, in accordance with the provisions of Chapter III, and/or other revenues. These may include cross-subsidies granted in accordance with Union law.’. ‘3. An en route charging zone shall extend from the ground up to, and including, upper airspace. Member States may establish a specific zone in complex terminal areas within a charging zone. 4. Where charging zones extend across the airspace of more than one Member State, which may be a consequence of the creation of a common charging zone in a functional airspace block, the Member States concerned shall ensure consistency and uniformity in the application of this Regulation to the airspace concerned to the maximum possible extent. Where uniform application of this Regulation to the airspace concerned is not possible, Member States shall inform users of such differences in application of this Regulation in a transparent manner and shall notify the Commission and Eurocontrol of such differences.’. costs stemming from international agreements. 3. In accordance with Article 15a (3) of Regulation (EC) No 550/2004, without prejudice to other sources of funding and in accordance with Union law, part of the revenue resulting from the charges may be used to fund common projects for network-related functions that are of particular importance for the improvement of the overall performance of air traffic management and air navigation services in Europe. In such cases, Member States shall ensure that comprehensive and transparent accounting practices are in place so as to ensure that airspace users are not charged twice. Those determined costs which fund the common project shall be clearly identified in accordance with Annex II.’. ‘1. The determined costs and actual costs shall include the costs relating to eligible services, facilities and activities referred to in Article 5 of this Regulation and established in accordance with the accounting requirements laid down in Article 12 of Regulation (EC) No 550/2004. The non-recurring effects resulting from the introduction of International Accounting Standards may be spread over a period not exceeding 15 years. Without prejudice to Articles 16 and 18 of Regulation (EU) No 691/2010, the determined costs shall be fixed prior to the beginning of each reference period as part of the performance plans referred to in Article 11 of Regulation (EC) No 549/2004 and Article 10(3)(b) of Regulation (EU) No 691/2010 for each calendar year during the reference period and in both real and nominal terms. Unit rates shall be calculated on the basis of the costs expressed in nominal terms. For each year in the reference period, the difference between the determined costs expressed in nominal terms prior to the reference period and the determined costs adjusted on the basis of the actual inflation recorded by the Commission (Eurostat) for the year shall be carried over no later than in the year n+2. Determined costs and actual costs shall be established in national currency. Where a common charging zone with a single unit rate has been established for a functional airspace block, the Member States concerned shall ensure conversion of national costs into Euro or the national currency of one of the Member States concerned so as to ensure a transparent calculation of the single unit rate in application of Article 13(1) first subparagraph of this Regulation. Those Member States shall notify the Commission and Eurocontrol thereof.’. ‘Staff costs shall include gross remuneration, payments for overtime, employers’ contributions to social security schemes as well as pension costs and other benefits. Pensions costs may be calculated using prudent assumptions according to the governance of the scheme or to national law, as appropriate. Those assumptions shall be detailed in the national performance plan.’. ‘Depreciation costs shall relate to the total fixed assets in operation for air navigation services purposes. Fixed assets shall be depreciated in accordance with their expected operating life, using the straight-line method applied to the costs of the assets being depreciated. Historic or current cost accounting may be applied for the calculation of the depreciation. The methodology shall not be altered during the duration of the depreciation and shall be consistent with the cost of capital applied. Where current cost accounting is applied, the equivalent historic cost accounting figures shall also be provided to allow for comparison and assessment. the weighted average of the interest rate on debts and of the return on equity. For air navigation service providers without any equity capital, the weighted average shall be calculated on the basis of a return applied to the difference between the total of the assets referred to in point (a) and the debts. Exceptional items shall consist of non-recurring costs relating to the provision of air navigation services during the same year. Any adjustment beyond the provisions of the International Accounting Standards shall be specified in the national performance plan for review by the Commission and in the additional information to be provided in accordance with Annex II.’. ‘For the purposes of the fifth subparagraph of paragraph 2, the factors to which weight shall be given shall be based on the proportion of financing through either debt or equity. The interest rate on debts shall be equal to the average interest rate on debts of the air navigation service provider. The return on equity shall be based on the actual financial risk incurred by the air navigation service provider.’. ‘For the purposes of point (b) of the first subparagraph, Member States shall, before the start of each reference period, define the criteria used to allocate costs between terminal and en route services for each airport, and inform the Commission thereof.’. 1. Member States shall, at the latest six months before the start of each reference period, offer to consult with the airspace users’ representatives on determined costs, planned investments, service unit forecasts, charging policy and resulting unit rates and shall be assisted by the air navigation service providers. Member States shall, in a transparent manner, make their national or functional airspace blocks costs established in accordance with Article 5 and their unit rates available to airspace users’ representatives, the Commission and, where applicable, Eurocontrol. the incentive schemes set out in Article 12. The consultation may be organised on a regional basis. Airspace user representatives shall retain the right to request more consultation. User consultation shall also be organised systematically following the activation of an alert mechanism generating a revision of the unit rate. 2. The information referred to in paragraph 1 shall be based on the reporting tables and detailed rules set out in Annexes II and VI, or, where a Member State at national or functional airspace block level has decided not to calculate determined costs or terminal charges or not to set terminal unit rates in accordance with Article 1(6), the information referred to in paragraph 1 shall be based on the reporting tables and detailed rules set out in Annex III. The relevant documentation shall be made available to the representatives of airspace users, the Commission, Eurocontrol and national supervisory authorities three weeks before the consultation meeting. For the annual consultation referred to in the second subparagraph of paragraph 1, the relevant documentation shall be made available to the representatives of airspace users, the Commission, Eurocontrol and national supervisory authorities each year, no later than 1 November.’. flights performed exclusively for the transport, on official mission, of the reigning Monarch and his immediate family, Heads of State, heads of Government, and Government Ministers; in all cases, the exemption must be substantiated by the appropriate status indicator or remark on the flight plan.’. ‘The costs incurred for exempted flights shall be composed of:’. 1. Without prejudice to the possibility pursuant to Article 3(2) of financing en route air navigation services through other revenues, the en route charge for a specific flight in a specific en route charging zone shall be equal to the product of the unit rate established for that en route charging zone and the en route service units for that flight. 2. The unit rate and the en route service units shall be calculated in accordance with Annex IV. 1. Without prejudice to the possibility pursuant to Article 3(3) of financing terminal air navigation services through other revenues, the terminal charge for a specific flight in a specific terminal charging zone shall be equal to the product of the unit rate established for this terminal charging zone and the terminal service units for that flight. For charging purposes, approach and departure shall count as a single flight. The unit to be counted shall be either the arriving or the departing flight. 2. The unit rate and the terminal service units shall be calculated in accordance with Annex V.’. 1. This Article lays down the traffic and cost risk sharing mechanisms. It shall apply in accordance with the principles referred to in Article 11 of Regulation (EU) No 691/2010. the over- or under-recoveries resulting from traffic variations, which shall be recovered no later than in year n+2. In addition, Member States may exempt from traffic risk sharing the determined costs of providers of air navigation services which have received permission to provide air navigation services without certification, in accordance with Article 7(5) of Regulation (EC) No 550/2004. 3. Where, over a given year, the actual number of service units does not exceed or fall below the forecast established at the beginning of the reference period by more than 2 %, the additional revenue or loss in revenue of the air navigation service provider with regard to determined costs shall not be carried over. 4. Where, over a given year n, the actual number of service units exceeds the forecast established at the beginning of the reference period by more than 2 %, a minimum of 70 % of the additional revenue obtained by the air navigation service provider(s) concerned in excess of 2 % of the difference between the actual service units and the forecast with regard to determined costs shall be returned to airspace users no later than in year n+2. Where, over a given year n, the actual number of service units falls below the forecast established at the beginning of the reference period by more than 2 %, a maximum of 70 % of the loss in revenue incurred by the air navigation service provider(s) concerned in excess of 2 % of the difference between the actual service units and the forecast with regard to determined costs shall be borne by the airspace users in principle no later than in year n+2. However, Member States may decide to spread the carry -over of such loss in revenue over several years with a view to preserving the stability of the unit rate. 5. The allocation of traffic risk referred to in paragraph 4 shall be set by the national or functional airspace block performance plan for the entire reference period, following the consultation referred to in Article 8. 6. Where, over a given year n, the actual service units are lower than 90 % of the forecast established at the beginning of the reference period, the full amount of the loss in revenue incurred by the air navigation service provider(s) concerned in excess of the 10 % of the difference between the actual service units and the forecast in respect of determined costs shall be borne by the airspace users in principle no later than in year n+2. However, Member States may decide to spread the carry-over of such loss in revenue over several years with the view to preserving the stability of unit rate. Where, over a given year n, the actual service units exceed 110% of the forecast established at the beginning of the reference period, the full amount of the additional revenue obtained by the air navigation service provider(s) concerned in excess of the 10% of the difference between the actual service units and the forecast in respect of determined costs shall be returned to airspace users in year n+2. 7. Air navigation service providers without any equity capital or with equity capital not exceeding 5 % of total liabilities as of 31 December 2011 may be exempt of traffic risk sharing during the first reference period, in order to allow achieving a lower proportion of debt financing. Those air navigation service providers exempt from traffic risk sharing shall be specified in the performance plan for review by the Commission and in the additional information to be provided in accordance with Annex II. Member States shall describe and justify the measures planned to achieve the lower proportion of debt financing and their timing. significant changes in interest rates on loans. Without prejudice to Article 6(1), third subparagraph, a list of uncontrollable cost factors shall be determined by the national supervisory authority from the list set out in points (i) to (v) of the first subparagraph and shall form part of the performance plan. Where, over the whole reference period, actual costs are lower than the determined costs established at the beginning of the reference period, the resulting difference shall be returned to airspace users through a carry-over to the following reference period. the variation in costs to be passed on to users is specifically identified and categorised. The amount carried over shall be specified by factors and described in the additional information to be provided in accordance with Annex VI.’. ‘1. Member States, at national or Functional Airspace Block level, may, on a non-discriminatory and transparent basis, establish or approve incentive schemes to support improvements in the provision of air navigation services or the reduction of the environmental impact of aviation, resulting in a different calculation of charges pursuant to paragraphs 2 and 3. Those incentives may apply to air navigation service providers or airspace users. 2. In accordance with Article 11 of Regulation (EU) No 691/2010, Member States, at national or functional airspace block level, may adopt financial incentives for the achievement of performance targets by their air navigation service providers. The unit rate may be adjusted to provide for a bonus or penalty according to the actual performance level of the air navigation service provider against the relevant target. Such bonuses or penalties shall only be activated where performance variations have a substantive impact on users. The applicable level of bonuses and penalties shall be commensurate with the targets to be reached and the performance achieved. The performance variation levels and the applicable level of bonuses and penalties shall be determined following the offer to consult referred to in Article 8 and set by the national or functional airspace block performance plan. accelerate the deployment of SESAR ATM capabilities.’. ‘1. Member States shall ensure that unit rates are set for each charging zone on an annual basis. Unit rates shall be set in national currency. Where Member States which form part of a functional airspace block decide to establish a common charging zone with a single unit rate, that unit rate shall be set in Euro or in the national currency of one of the Member States concerned. The Member States concerned shall notify the Commission and Eurocontrol of the applicable currency. 2. Pursuant to Article 11(4)(e) of Regulation (EC) No 549/2004 and Article 18 of Regulation (EU) No 691/2010, unit rates may be amended in the course of the year where an alert mechanism is activated.’. ‘4. For the first year of the reference period, unit rates shall be calculated on the basis of the performance plan communicated by the Member State or functional airspace block concerned on 1 November of the year preceding the beginning of the reference period. Where performance plans are adopted after 1 November of the year preceding the beginning of the reference period, unit rates shall be recalculated where necessary on the basis of the final adopted plan or the applicable corrective measures.’. ‘1. Member States may collect charges through a single charge per flight. Where charges are billed and collected on a regional basis, the billing currency may be the Euro and an administrative unit rate remunerating billing and collection costs may be added to the unit rate concerned.’. ‘Air navigation service providers shall facilitate inspections and surveys by the national supervisory authority or by a qualified entity acting on the latter’s behalf, including site visits. The authorised persons shall be empowered:’. The review by the Commission of the performance scheme, referred to in Article 24 of Regulation (EU) No 691/2010 shall include the risk sharing mechanism set up in Article 11a of this Regulation, the incentive schemes set up pursuant to Article 12 of this Regulation, and their impact and effectiveness in achieving the set performance targets.’. Annexes I to VI are amended in accordance with the Annex to this Regulation. Those Member States with national regulations which existed prior to 8 July 2010 that establish a reduction on the unit rate beyond the Union-wide targets established in accordance with Regulation (EU) No 691/2010 may exempt their air navigation service providers from Article 11a (3) of Regulation (EC) No 1794/2006. That exemption shall apply for the period where the national regulations reduce the unit rate, but shall not extend beyond the end of the first reference period in 2014. Member States shall inform the Commission and Eurocontrol of such exemptions. Member States may decide not to apply the provisions of Regulation (EC) No 1794/2006 as amended by this Regulation to terminal charges until 31 December 2014. They shall notify the Commission thereof. Where Member States exempt terminal charges from the provisions of that Regulation, the full costs of the provision of terminal air navigation services may be recovered until 31 December 2014. This Regulation shall enter into force on the third day of its publication in the Official Journal of the European Union. It shall start applying to the air navigation services costs, charges and unit rates of the year 2012. Done at Brussels, 16 December 2010. (3) OJ L 341, 7.12.2006, p. 3. (4) OJ L 201, 3.8.2010, p. 1. (5) OJ L 201, 3.8.2010, p. 1.’. Where there are more than 150 000 commercial movements per year, the assessment referred to in points 1 to 4 shall be carried out at each individual airport.’. 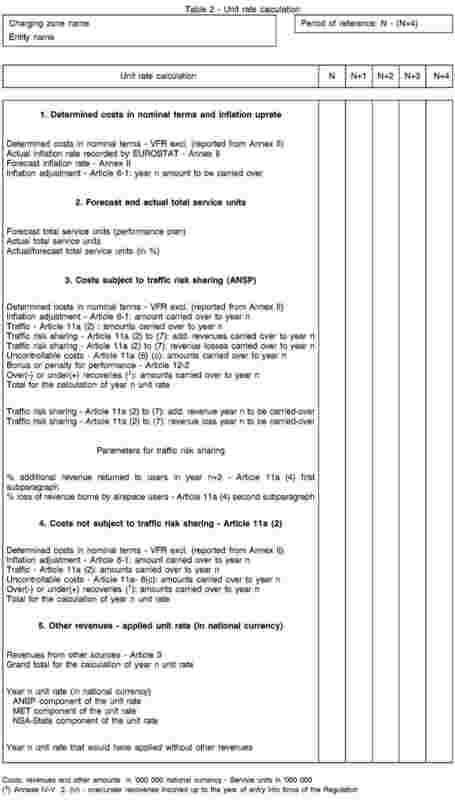 Member States as well as air navigation service providers shall fill in the following reporting table for each charging zone under their responsibility and for each reference period. Member States shall also provide a consolidated reporting table for each charging zone under their responsibility. A consolidated table shall be filled in for all airports subject to the provisions of this Regulation. When a charging zone extends across the airspace of more than one Member State, they shall fill in the table jointly in accordance with the arrangements referred to in Article 4(4). Actual costs shall be established on the basis of the certified accounts. The costs shall be established in accordance with the business plan required by the certificate and reported in the currency in which they are established in accordance with Article 6(1), fourth subparagraph. In order to facilitate the establishment by the Commission of Union-wide performance targets and without prejudice to the performance plans to be adopted at national or functional airspace block level, Member States as well as air navigation service providers shall fill such reporting table with initial forecast figures eighteen months before the start of a reference period. Every year of the reference period, description of the reported actual costs and their difference against the determined costs.’. The en route service unit shall be calculated as the multiplication of the distance factor and the weight factor for the aircraft concerned. The distance factor shall be obtained by dividing by one hundred the number of kilometres flown in the great circle distance between the entry and the exit point of the charging zones, according to the latest known flight plan filed by the aircraft concerned for air traffic flow purposes. If the exit and entry point of one flight are identical in a charging zone, the distance factor shall be equal to the distance in the great circle distance between these points and the most distant point of the flight plan multiplied by two. The distance to be taken into account shall be reduced by 20 kilometres for each take-off from and for each landing on the territory of a Member State. The weight factor, expressed as a figure taken to two decimal places, shall be the square root of the quotient obtained by dividing by fifty the number of metric tons in the maximum certificated take-off weight of the aircraft as shown in the certificate of airworthiness or any equivalent official document provided by the aircraft operator. Where this weight is unknown, the weight of the heaviest aircraft of the same type known to exist shall be used. Where an aircraft has multiple certificated maximum take-off weights, the maximum one shall be used. Where an aircraft operator operates two or more aircraft which are different versions of the same type, the average of the maximum take-off weights of all his aircraft of that type shall be used for each aircraft of that type. The calculation of the weight factor per aircraft type and per operator shall be effected at least once a year. 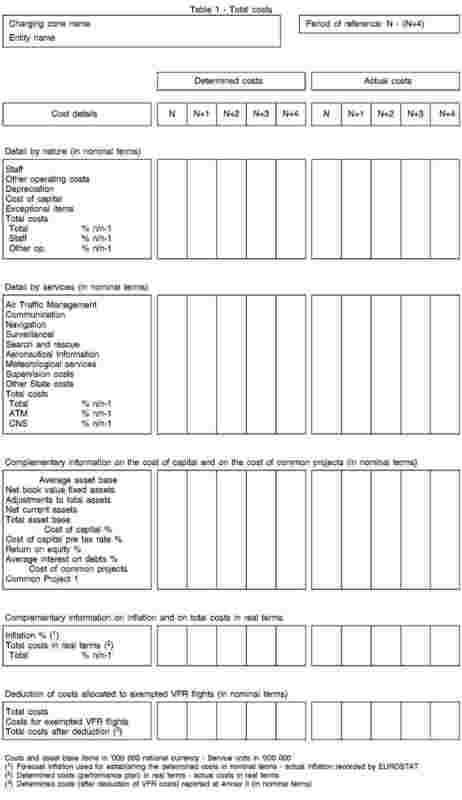 The en route unit rate shall be calculated before the beginning of each year of the reference period. a deduction of the costs of VFR flights as identified in Article 7(4).’. The terminal service unit shall be equal to the weight factor for the aircraft concerned. The weight factor, expressed as a figure taken to two decimal places, shall be the quotient, obtained by dividing by fifty the number of metric tons in the highest maximum certified take-off weight of the aircraft, referred to in Annex IV point 1.5, to the power of 0.7. However, in a transitional period of five years following the calculation of the first terminal unit rate under this Regulation, this exponent shall be comprised between 0.5 and 0.9. The terminal unit rate shall be calculated before the beginning of each year of the reference period. Member States as well as air navigation service providers shall fill the following reporting table for each charging zone under their responsibility and for each reference period. Member States shall also provide a consolidated table for each charging zone under their responsibility. When a charging zone extends across the airspace of more than one Member State, they shall fill the table jointly in accordance with the arrangements referred to in Article 4(4). Description and explanation of incentives applied on users of air navigation services.’.